(CNN) -- The executive producer of the "Late Show with David Letterman" defended the company's treatment of women in response to a letter from the president of the National Organization for Women, who said the star's actions created a "toxic environment." David Letterman admitted an affair with a staff member on his October 1 show. "Since we started as a company in 1993, we have taken very seriously the issues you raise regarding respect for women in the workplace," Rob Burnett wrote in a letter dated October 15. Burnett also is president and CEO of the production company, Worldwide Pants. "And, as an employee of David Letterman's since 1985, I have personally found the work environment on his shows to be fair, professional and entirely merit-based at all times." Burnett was responding to a letter dated October 9 from Terry O'Neill, NOW president, who asked to meet "to discuss respect for women in the workplace and your company's obligation to strive for gender parity in decision-making at all levels within your organizations." In response, Burnett pointed out that Letterman's admissions "did not stem from a complaint from anyone on our staff, but rather from an alleged attempt to commit a crime, extortion, against Dave, who decided to take the matter to law enforcement. "Since that time, our human resources department has consulted every member of the 'Late Show' staff, and not a single complaint has been raised or filed." A CBS producer, Robert "Joe" Halderman, is accused of threatening to go public with information about Letterman's private life unless the 62-year-old comedian ponied up $2 million. The "Late Show" host has publicly apologized to his wife, Regina Lasko, who, he said, had been "horribly hurt by my behavior." He said he is trying to repair that relationship. 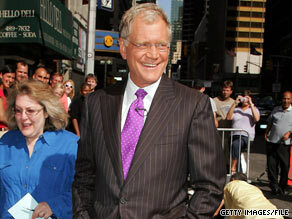 Letterman and Lasko married in March and have a 5-year-old son. The affairs took place before the marriage, Letterman's production company has said. One of the women involved in a relationship with Letterman was identified as an assistant to the talk show host and a former live-in girlfriend of Halderman's.